After a tragic ending to her short-lived superhero stint, Jessica Jones settles in New York City and opens her own detective agency, called Alias Investigations, in the hopes of rebuilding her life and keeping the lights on in her aprtment. 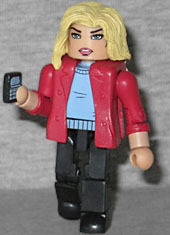 While there's been a figure of Jess' secret identity, Jewel, before, there's never been a plain Jessica. The show didn't stray too far from the comic's designs, putting her in a black leather jacket, a gray tank top, and fraying blue jeans. She's played by Krysten Ritter, who didn't seem like the best choice when the casting was announced, but boy did she win us over! 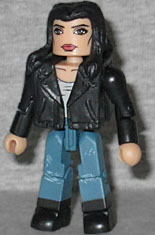 The Minimate caricatures her well, with large eyes, bright red lips, and black hair that falls down over her shoulders. So you can have a more casual Jessica, the set includes a pair of bare arms for her - after all, it's not like she'd want to wear the jacket when she's just relaxing at home. We also get an extra pair of hands, one holding a carton of Chinese food and the other holding chopsticks! Yes, these originally came with one of the Big Bang Theory sets, but now they're available with toys that wouldn't be a huge embarrassment to own! [Basplingee! --ed.] 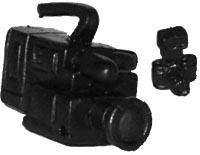 She also has the tools of her investigatory trade: one still camera, and one video camera. So much evidence of cheating spouses to collect! Next we have Jessica's best friend, Trish Walker. You may know her better as Hellcat, but not in the show. Here she's a former child star who's now a talk radio personality, which is why she's just wearing a red jacket, blue sweater, and black pants - no costumes for her (at least yet)! You can take her jacket off and replace her arms with a pair that match her shirt. Her blonde hair falls over her shoulder, and sits high enough that it doesn't block her movement too much. This set includes three cellphones that you can give to whomever you want, but also includes a television. A television! It's showing a scene from Trish's old show, It's Patsy - either the credits or a commercial bumper. 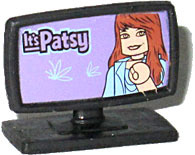 The logo is exactly from the show, and the image of Patsy herself has been Minimate-ized, to keep it in the style required. While Daredevil was just about Daredevil, Jessica Jones did its part to set up the next series by introducing Luke Cage. 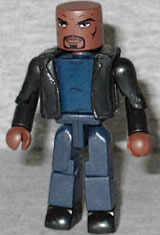 This is a very plain Minimate, just a bald guy wearing a dark blue shirt, black jacket, and even darker blue pants. No hints of yellow to be found here, because he was trying not to attract any attention. The likeness of Mike Colter is good, and it will be interesting to see if any changes are made when the Luke Cage Minimate box set comes out. We get alternate arms in case you don't want him to be wearing his jacket inside. 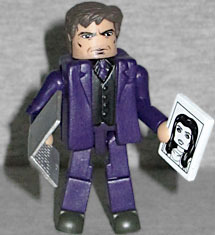 The Doctor Who Minimates might never have happened, but at last we get a David Tennant figure! He's looking angry and slightly scruffy, as he should, and though the live-action Purple Man might not be purple, but his suit is. He's wearing the jacket that comes with a buttoned-up vest, rather than the one that's open to expose the shirt and is usually paired with a separate neck tie. Under normal lighting conditions, the purple of the suit is so dark as to almost look black, but better that than lavender, right? His accessories include a silver laptop (unless you want to give that to someone else) and a candid picture of Jessica. A Minimate picture, naturally. Like the other figures, he has alternate bodyparts - black arms, so you can remove his jacket, and bare feet, so you can remove his shoes. You know, if you want to stand him in ankle-deep water for some reason. He's also got the set's only alternate head: it's him angrily using his powers, with his mouth open in a yell and big purple veins on his face. This set may not seem like much at first - it's just four plain people, none with costumes - but with enough extra parts to create fun variant looks, and some really cool accessories, this is a lot of fun. This entry was posted in Art Asylum, Marvel, MMMR. Bookmark the permalink.